We were inspired to create this gift box by our favorite date snack – the “PB&D,” otherwise known as the Peanut Butter & Date. 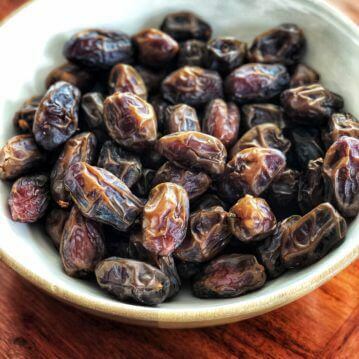 We discovered that our delicious dates are amazing with a swipe of good peanut butter and a pinch of sea salt. The PB&D is one of simplest and most delicious ways to enjoy dates! Because every great date deserves a great mate we were thrilled to discover a delicious line of artisan nut butters produced in Colorado by PB Love Company that pair beautifully with our dates. We’ve combined these handcrafted treats in one box. Each gift box includes a 1 pound box of our delicious medjool dates, hand packed in our signature kraft box and tied with seasonal ribbon and a pair of mini bamboo tongs, one 8.5 oz jar of PB Love Co. Classic Crunchy Peanut Butter, and one .2 oz bottle of Maldon Sea Salt. The Date Lovers Gift Box makes the perfect gift for you or someone you want to impress! Note the Date Lovers Gift Box ships separately.